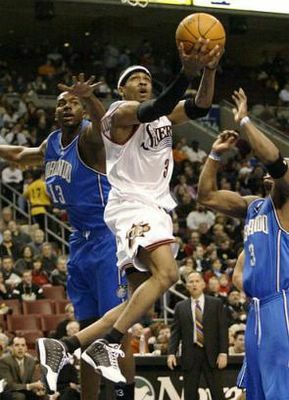 Last night I caught the second half of the Sixers-Magic game after I heard that Allen Iverson had 29 points in the first half. Generally when Allen goes over 20 in the first half, you know how the rest of the game is going to go. You just let him go and defend all of the other Sixers. And go he did. The mighty bubba-chuck hit 24 of 27 free throws and ended the game with 60 points, a new career high, and one of only 3 performances to go over 60 points in the regular season. To put that in perspective, Wilt Chamberlain's 100 point night in Hershey was one of them. Good Work, AL.